Lottie Cakes: This week I had a photo picked out and ready to go but then last night something special happened. We started out a lovely evening by riding motorbikes around Koh Lanta Island, stopping to check out the local market before ending up at a waterfront restaurant in Old Town. After dinner you and your little friends giggled and chased kitty's while we settled up the bill and prepared for the long ride home. 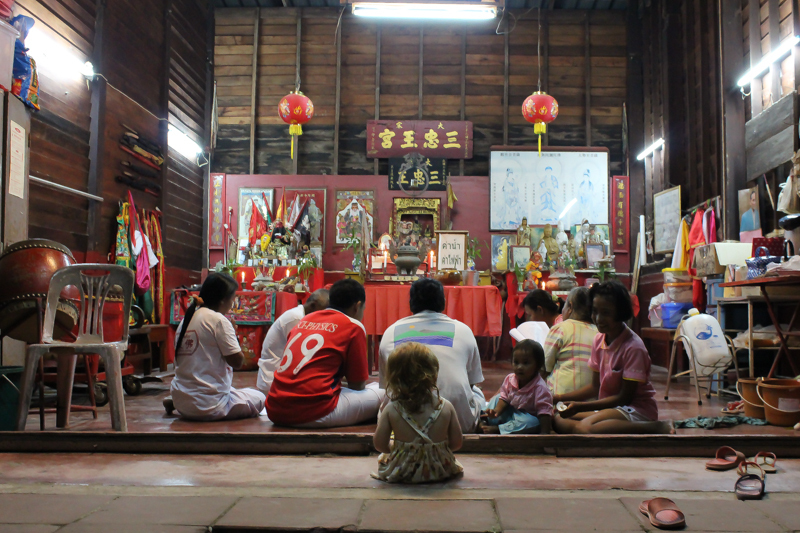 On the walk down main street you stopped in front of a Buddhist family in the midst of prayer and quietly walked up to the them, without entering their space, while we stayed behind watching. Gently you sat down, entranced and while we whispered to you we should go, you sweetly smiled and refused. After their prayer time was finished they turned to you, asking you questions, tickling your little tummy. The other children surrounded you and you darlings communicated in a way small ones who speak none of the same words can do. It was such a lovely experience, you knew something sacred was going on and your usually wild, energetic, talkative self sat there respectively taking it all in. After hugging the little ones goodbye we rode off with you wrapped in my arms and chatting endlessly the whole way home.